I got out in the sunlight today and snapped a few pictures of Arroway looking good. Now that the knitting is further behind me and I’ve worn it and felt how warm and plush it is and I’ve seen the colors in the sunlight I’m a lot happier with it than I was at the moment of bind off. 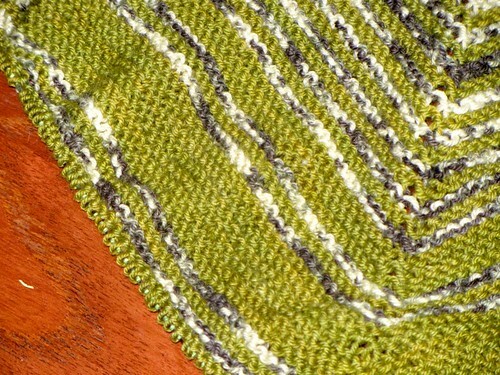 This is the second installment from the Stephen West Westknits Shawl Club. 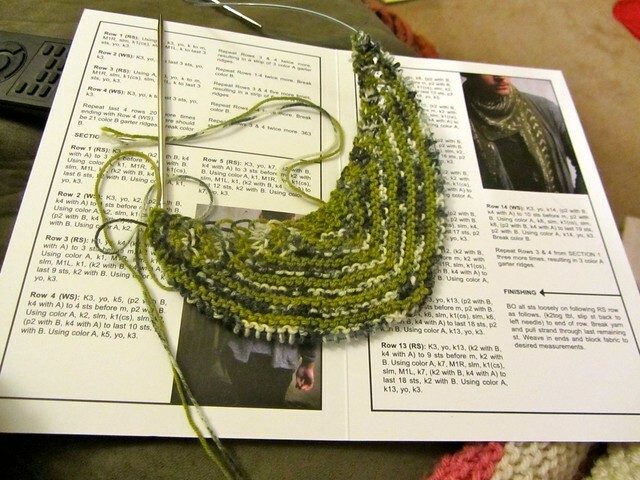 The yarn this time around was from Lorna’s Laces in their Shepherd Sock line. The colors are mossgatherer and newsprint (I’ll let you decide which is which.) It’s definitely not as soft as the Tosh Merino Light from the last club installment but the yarn is plumper and has a more substantial feel. I hated every minute of making these arrows. 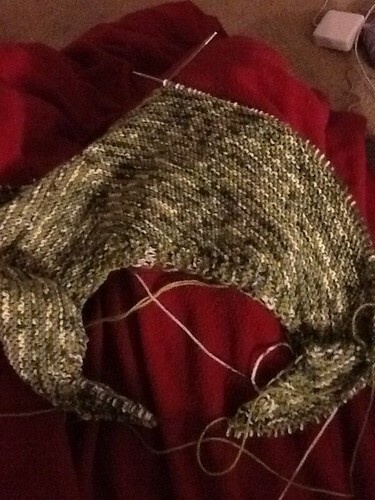 Stranding on the wrong side is exceedingly painful and even seven rows was almost too much. 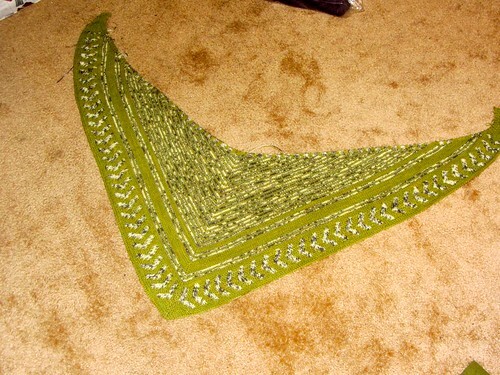 It also gives the shawl a right side and a wrong side as you can see in the first picture. 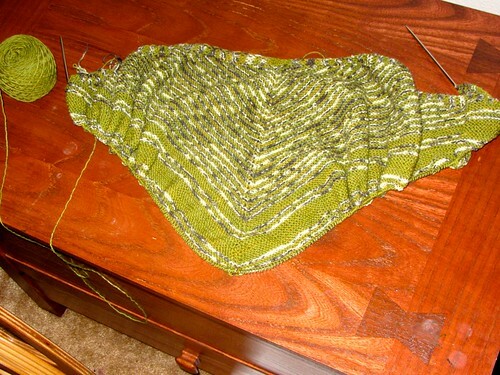 Now that its done and blocked and the arrows don’t look as messy I’m much more pleased with it. I used all but about 7 yards of the main color, so be careful using anything with less than 420 yards per skein. The pattern and the yarn will be available to non club members in May. Can’t wait to see what February brings! 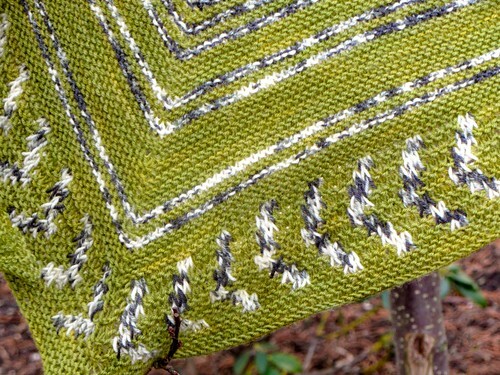 I finished the knitting on Arroway today. The purl-side stranding drove me nuts as expected. Even though there were only seven wrong-side rows it was enough to make finishing this very unpleasant. My tension on the wrong side was totally wonky because I’m not used to stranding to the front. I’m falling back on the belief that blocking will cure everything. As you can see, the arrows are a bit scrubby looking right now. Once it’s blocked I’ll give you all the details and a full review. Right now I’m too sick of it to give it a fair review. How many more pictures of garter stitch can you all withstand before you leave me and never come back? A few more I hope since all I’ve been working on for the past couple days is my arroway. Nothing but miles and miles of stripy garter stitch. I did get to the point where the stipes go from 1×1 to bigger green stripes. This means I am close (4 rows) to adding the arrow border. 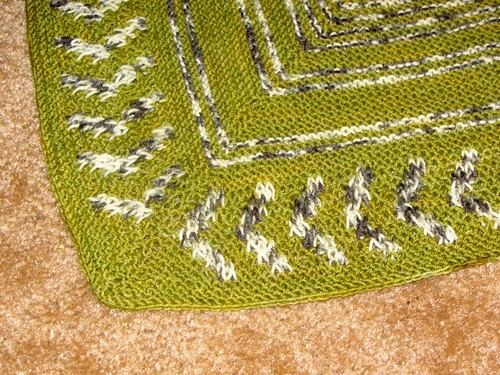 Originally, I was excited to get to the arrows because I thought the colorwork would provide some interest. Then I realized that the colorwork is worked flat which means I will have to strand in front on the wrong side. No me likey. This has become more a project of will power than of true enjoyment, but I will prevail. I’m even likely to finish before February, my self-imposed deadline. Fingers crossed. …Though it’s less enchanting than it started out. I’m ready for the colorwork section now please. Only 20 rows more till I get there… of course, every row gets bigger. 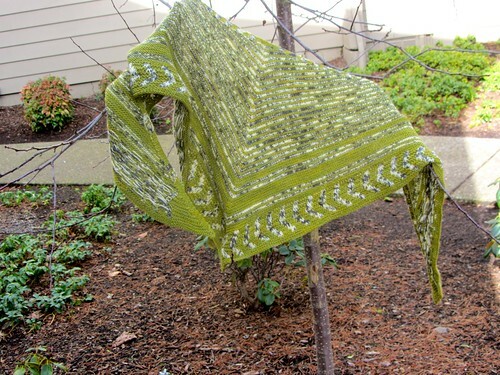 My newest installment of the Westknits Shawl Club arrived yesterday. Of course I cast on immediately. The new pattern is Arroway. 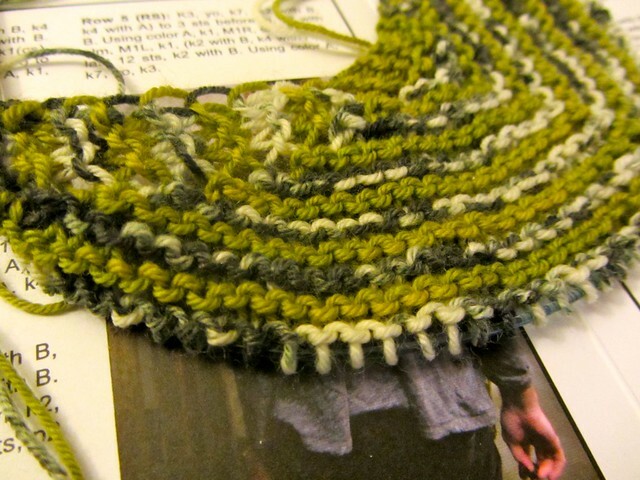 It’s garter stitch stripes (lovely and squishy) for most of the body with colorwork arrows around the bottom edge. The green is Stephen West’s exclusive colorway. The white/black is apparently exclusive to the yarn company hosting the shawl club, but not exclusive to the club members. The green is called Moss Gatherer, the black/white is Newsprint. Both are Lorna’s Laces Shepherd Sock 80% wool, 20% nylon. I was seriously just thinking that I needed to add a little garter stitch to my WIPs for knitting at home after long school days. This will be perfect. Best gift ever!